SomethingToGive.org is the brainchild of Andy McRea, who believes that increasing involvement in the community is a powerful solution to many of our current social and economic issues. He has created SomethingToGive.org as a mechanism to inspire individuals to ACTION. The inspiration for SomethingToGive.org can be traced back to Andy's experience in Iceland. As part of the orca whale staff at the Keiko Foundation, Andy lived in Iceland for a short time, where volunteerism and community stewardship are built into that population's core values. For instance, all teenagers on summer breaks perform maintenance of their neighborhood infrastructure. Painting schools and supporting their local parks and public spaces gives them a life-long sense of pride and ownership in their community. Back in America, however, Andy recognized that the cultural norm is to ask "What's in it for me?". He also realized that many in his community were disconnected from it, involved only in their own day-to-day lives. He wondered if there was a way to motivate people to interact with others in the community, given that most people have never volunteered before but many feel they should. His experience with the Keiko Foundation gave Andy his solution. 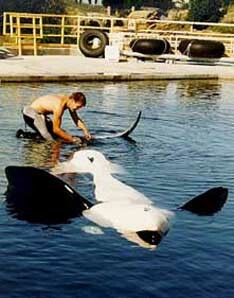 While working with Keiko, Andy had the power to give backstage tours to his friends and family, which provided a very personal interaction with a captive celebrity Orca whale. For guests, it was a magical experience - a chance to get VERY close to (even scratch and swim with) a killer whale. That was far more intimate than the tourist view from the visitor's gallery. For Andy, his workday was transformed into a special sharing experience that turned 'just another day at the office' into a 'fun day of show and tell' at the office. Andy believes that whether it is offering a desirable experience, or by volunteering our time, we all have something to give. Andy has traveled in too many countries to count and has had an amazingly varied professional life - Scuba Diver, working with Free Willy/Keiko Foundation and swimming with Keiko, Corporate Executive, a stint with Microsoft, and a successful entrepreneurial owner/manager of a 'Green Builder' General Contracting company years before 'green' was the thing. Andy's variety of experiences over the years brings great breadth to SomethingToGive.org. His entrepreneurial nature is the basis of the full toolbox of skills he offers to the organization's development. His passion for volunteering shows in his many community leadership positions and he is a believer in giving back to his community and the world. Thinking that everyone should have as much fun as he has volunteering, Andy has started SomethingToGive.org with the support of his family and a fast growing group of wonderful supporters that believe in the idea. He has a B.A. from University of Washington - Go Huskies! Andy's passion is his family and making the world a better place than when he found it. Doug brings 18 years of finance and process management experience to SomethingToGive.org. His last role was as Finance Director for The Royal Bank of Canada's U.S. Private Client Group. Doug holds an MBA - Finance from the University of Washington and a B.A. in Accounting from Michigan State University. Doug's past volunteer work includes Habitat for Humanity, Northwest Harvest, and Meals on Wheels. A musician on the side, Doug has played drums for 25+ years, toured extensively throughout the Midwest, and currently performs with a Seattle-based band. Kris spent a decade in wireless distribution and marketing before leaving her senior management position to focus on higher causes and family. Now she's back to support the SomethingToGive.org revolution, contributing her non-profit experience and an incredible passion for taking care of volunteers. Kris is also a massage therapist, a PTA President, and is active in her community of Whidbey Island, WA. She has a B.A. in Communications from University of Puget Sound. Bill has more than 15 years experience in software design and development, leading the development efforts of many start-ups in and around the Seattle area. He specializes in C++ and C#/.NET development, and over the last few years has expanded his expertise to web and infrastructure development. In addition to his work with SomethingToGive.org, Bill is the Senior Tools Engineer for The Amazing Society, a Gazillion studio located in Issaquah, Washington, and the owner of WDBDesign, a software and web technology consulting company. Randy has worked for 12 years as a graphic designer, 3D animator, and interactive designer. He holds a BA in Education, but has never taught in a classroom setting...with a passion for design and animation, he hasn't looked back. His most recent role was at Teague, where he spent 6 years working as Senior Interactive Designer, creating interactive presentations for Boeing. He is now focusing again on the thing he loves the most, inspiring others with his work in motion graphics, art, film, and design. Consultants and experts from many areas of life are helping to inspire, steer, critique, and bring this vision online. Distribution managers, business owners and CFOs, graphic designers and website developers, fundraisers, writers, and community activists are donating their time and expertise to make this dream a reality.